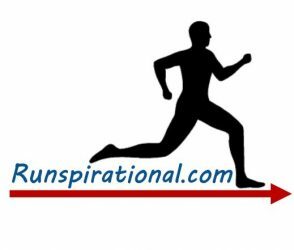 Blog – Page 6 – Run to Inspire. Inspired to Run. The race I am running this weekend is on Sunday. 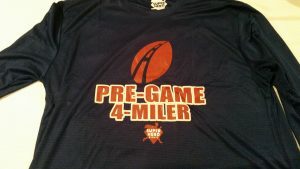 The Pre-Game 4 Miler allows you to pick up your packet on Friday or Saturday at the Running Company in Morristown. I decided to go pick it up tonight. I’d never been to the Running Company but it was a nice store. I ended up purchasing one of The Travel Sticks. I’ve been intending to get one to help with recovery and warming up, so when I saw it there I figured I’d check out the price. They had it at the cheapest price I’ve seen online, so I picked it up. I like to help out the local running stores whenever I can. I think it’s great how they help out for a lot of races with being packet pick up locations. I really liked the long sleeve t-shirt I received tonight for this race. I don’t know if it’s just because I love football so much, but I thought the front was really neat looking. Glad to add it to my collection. After I was done there, I decided to drive the course. I’ve never run in Morristown, so this was all new to me. I actually parked right near the start of the race, without even knowing, so it worked out well when I decided to drive the course. The course has some hills throughout it that look challenging. Not sure what that will do to my time but I’m glad I could see where they are roughly and how long they are. I think it’ll help me mentally prepare more for it. The area around my house that I run has a lot of hills so I think I’ll be up for the challenge. I have to be, right? Since I have the race this weekend and I’m taking off today instead of doing a long run, I kept my Friday work out as a cross training day. I ended up going for 45 minutes on the elliptical. Kept the resistance at a lower threshold. I just wanted to get loose, burn a lot of calories, get a great sweat going, and let my legs take it easy. Mission accomplished. 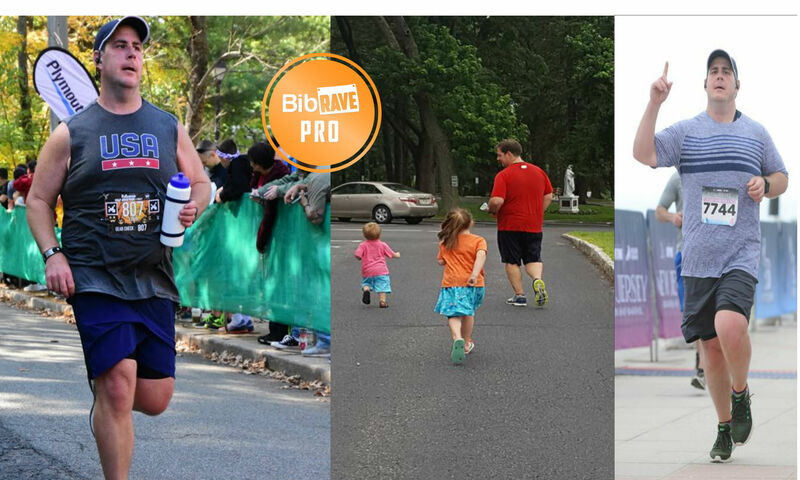 When is your next race? What race is it and what’s the distance? Would love to hear from you. Good luck to all that are running this weekend. Today was a good lesson for me. It shows that where there is a will there is a way. My daughter was not feeling well, so we decided to keep her home from school. I was planning on getting my outside run in today during my lunch hour. With staying home with her, I knew that was impossible. I realized my only chances to go for a run would be right at that moment before my wife left for work or late tonight when she got home after a late night work function. I prefer to run during the morning or afternoon for safety reasons. Plus, I feel like if I push it off until that late and with being with the kids all day, I might be wiped out and not go. So I quickly got ready and out the door I went. It worked out for the best. With the pre-game 4 miler this weekend, I realized a shorter run would be in my best interest. I ended up just running 3.5 miles with 2.5 miles of it being done around the track. I have noticed that the track’s softer impact is nice on my legs, but I seem to run slower on the track then I do on the road, even though it’s a flat surface. I don’t know if it’s just the scenery or what, but something I’ve been noticing each week recently. After taking my daughter to the doctor and finding out she has the flu, I’m glad I got that run in first thing. I’m a daddy first and my attention has been all her’s today taking care of her and then bringing her baby brother to the doctor just to make sure he didn’t have the flu either. Thankfully, he tested negative and can go to school. So today just shows that you need to be able to adjust, roll with the punches. Things will work out no matter what. Don’t get caught up on your plan not working out to a tee. Just continue to strive to stay on course and give a great effort every time. How do you adjust when your schedule changes suddenly? Would love to hear from you. Let me know. So I love it when I’m asked if I want to run in the Clydesdale division. It always produces a nice giggle out of me. It makes me think of myself as this big, strong runner galloping down the road, then reality sets in. I do like the idea though. I know some don’t. It’s similar to age range groups to me. Just another fun category to try and see how one fairs against similar runners. For this race, the division starts at 200 lbs. There aren’t a lot of choices for races in NJ from January to March, so this one fits in well. I like the idea of running on Super Bowl Sunday in a race considering the appetizers and beer I plan on enjoying during the game. It’s kind of like running a race on Thanksgiving. At least it counters some of the calories that will be coming in to my body. The race starts at 11:00 am. I’ve never run a race with a later start time like this, but it should be fine. Currently, a lot of my weekend runs overlap 11:00 am, so my body should be fine with it. This will be a new course for me. Not sure if I’ll get to drive it prior to race day or if I’ll just wing it. Not a fan of winging it, so hopefully I’ll be able to find a video online of it or drive it later in the week. I’ve heard about a nice hill on it around mile 2ish so at least I’ll be prepared for that. My legs look forward to it. If you’re planning on running this race, let me know. As for today’s work out, it was a cross training today. I had a nice intense work out on the elliptical for an hour. Burned a lot of calories, produced a good sweat, and pushed my legs. Sometimes all it takes is a good run to help you get into a better mood. At least, that seems to help me. A good run is a stress reliever for me. It helps me clear my head. Think about things that are going on. Think them through and hopefully lift some of the weight off of your shoulders from whatever was going on. Today was one of those days for me. Work has been a beast this week. There was a part of me that didn’t even want to work out or run. But the other part said, really, something like that is going to get you to skip out on your half marathon training, on your health, on you going for your goals? I knew it would help and it would be worth it. It was snowing in NJ today and I was scheduled for a treadmill run anyway, so things broke the right way. I went to the gym and decided to lift my chest and shoulders first. I need to lift more as part of my training, so I’m trying to make sure I do it when I’m at the gym. After lifting, I hopped on the treadmill. I had thought about what speeds I would run and when I would increase them. Well as I got going, I was feeling good. I decided I wanted to crank it up through out the run and run just a little bit longer of a distance. I mean, hey, I had to burn off those brownies I ate last night … oh and probably the ones I’m going to eat tonight. I really sprinted hard for the last 5 minutes. Cranking up the speed every minute, every 15 seconds, every 10 seconds. I was breathing hard at the end when my 60 minutes hit. I ran for 57 minutes and ran 6.25 miles. I walked 3 minutes to warm up and get my music going, TV on, comfy and covered .15 miles plus another two minute walk at the end for 62 minutes and around 6.53 miles. Be Runspirational. Run to Inspire. Inspired to Run! It’s a new week and here are some new thoughts. Second, I’ve been looking at so many tweets with #earthaton and started looking into it. I think I’d like to join but I have no clue which team I should join. I feel like I’m the new kid at school, no one knows me, and I have to pick a lunch table to sit at. Will these other runners want me at their table? Will anyone talk to me? What if I pick a group that I just don’t blend with? Do I have to do the whole, sorry it’s not you it’s me? All kidding aside, I know all of the groups would be awesome and I’m sure welcome me with open arms but still, it’s a decision I don’t want to make without knowing exactly what I’m deciding. Thirdly, I’m going to try and get more reviews going. I have no idea if anyone cares about my opinion, but hey maybe I can help someone out there in internet land make a decision. Lastly, I’m thinking about getting a few tshirts made up for Runspirational.com. I have no idea if I should order extras, if anyone would want one or not. I don’t want to get left with a box full of them in my garage lol. I know I’ll wear them and my wife and kids will because they are good sports about that. Just wondering if anyone else out there might be interested. I will share a photo with them when I make a decision about whether or not I should move forward with it. As for my work out today, I ran 4.05 miles. It was a nice easy, slow recovery run. I felt good at the end. Definitely loosened up my legs. I felt good. It’s definitely different to run slower on purpose but it’s all part of the plan. I ran up at the track to help give my legs/joints a softer surface to enjoy. OK well let me know your thoughts. Be Runspirational. Run to Inpsire. Inspired to Run. Today was a rest day for me. I did a pretty good job of giving my legs a rest. Part of me just wants to keep going but I understand the importance of giving your legs and body a rest and time to recover. My son wouldn’t go down for his nap today, so I decided I would lay down with him and cuddle. It was so nice to lay down in the middle of day. I got a quick 15 or so minute nap in and just laid there enjoying the time with him while he napped. Can’t beat a day when you get that opportunity. I’ve been reading a lot about recover, especially from long runs. During the 5K that I ran in December, there was a local PT place with a booth. They had a hand out that promoted a recovery lounge with Normatec Compression Boots and Sleeves. If any of you have ever used these for recovery, I’d love to hear your thoughts. I’ve been thinking about buying a a package and trying them out after my long runs. I’m also looking at picking up the travel stick or something similar for recovery and warm ups. If you have one of these, let me know your thoughts. I’m thinking about running a race this Sunday. It’s a 4 miler. It’s not too far from home and with it being on Super Bowl Sunday, I think it might be a good idea to burn a few calories lol. It would take the place of a long run and I would rest on Saturday instead. I’ll keep you updated if I sign up. Just need to make sure it fits in the schedule with the kiddos. I’m trying to get a few reviews done and also add a section or two to the site including interviewing other bloggers. Will keep you updated on that. Looking forward to my run tomorrow. Keep being Runspirational. Run to Inspire. Inspired to Run. Today was a very interesting run. I did my long run for the week. 9 miles was the goal. At first, I thought I was going to run a similar route to last week, but decided during breakfast, I was going to run in a different direction. I started out and hit two steep hills in the first mile. Last week, I hit these same two hills around mile 6. It was nice to get them out of the way right away today. I then hit a flat part of the run and everything was going great. I hit around mile 3 and decided I wanted to test myself a little more. I ended up running down to the town’s main avenue and started at the bottom. It’s about a 1.25 mile run up a mountain basically. I hit the first third of it and felt great. Happy I decided to do it. Then I was about half way up and what a coincidence but Fergie (Black Eyed Peas) is singing Meet Me Halfway. It was literally half way up the mountain and just over half way into my run. I had a good giggle. As I popped up higher on the road I saw the final incline and it’s a doozy. This is a section of road that they have to close down during snowstorms due to cars not being able to get up it in snow. I’ve seen buses not get up this incline and get stuck. I had never run this road. Today was the day I was going to conquer. I kept pushing through. My pace slowed but I didn’t stop. Of course, I’m huffing and puffing and just when I’m a hundred yards or so away, I pass a woman walking her dog and she’s smoking. Oh great I though. Not only am I gassed from running up this behemoth but now I’m basically going to be smoking a cig as I’m just trying to get to the top. Took me awhile to get my legs back under me but I did. I was happy with my splits over the last few miles. Now the funniest part of the run happened around mile 6 when I decided to have a Gu. I forgot my water, so taking the Gu was going to be interesting. My mouth was a bit dry but I was able to get the Gu down. Of course I have it pasted in my mouth and I hit a point where I need to spit. Not thinking, I turn my head, go to spit, and next thing you know it barely leaves my mouth. I basically spit on my face. I wiped it with my hand and of course I see a car passing me. All I could think of was, oh great, probably someone I know. When I finished my run. I got home and as I walk through the door, the first thing my daughter says to me is, “Daddy, what’s all over your face?”. Of course, I think I’m just a little wind burned or red. I thought, man it was windy but I didn’t think it was that bad. I walk into the kitchen and my wife asks me the same thing. She’s like you have brown stuff all over your face. So apparently, I didn’t wipe off the Gu goober. I simply smeared it into my cheek. Now I’m thinking about all of the people I ran past over the last 2 miles that must have been looking at me like what the hell is wrong with that guy. Overall, very good run. The mountain took a lot out of me but I was please. I ran the 9.01 miles in 1:28:17 for a 9:48 pace. Change Things for the Better! My work out for today is below the meme but I wanted to touch on this first. So earlier this morning, I was searching for a quote to post on the Runspirational Twitter and Facebook feeds. I came across the below quote from George Sheehan and it really hit me with everything that’s going on. No matter how you feel or what you believe in, we all can make a difference moving forward. We can make things better for ourselves if we are dedicated, disciplined, have the energy, and the feeling that we can change things. Make changes positively. Challenge yourself every day to be better. Dedicate yourself to you. Learn how to push yourself to be more discipline and devote the energy you need to be better. Feel yourself changing things for the better. It will be addicting, positively addicting and can spread. Know that you are worth it and you have it in you to do it. I know you do. I know I do. Be Runspirational! It’s been a busy but fun Friday. Today was a cross training day for me. I hit the gym and got on the elliptical for 47 minutes. I concentrated on maintaining a good speed, not as fast as earlier in the week, and keeping my heart rate elevated. According to my Fitbit Surge, I was able to burn 852 calories during my work out. My legs feel good, exactly what I was looking for, before tomorrow’s long run. I’m scheduled to run 9 miles tomorrow so I’m making sure I’m hydrating and getting my legs ready. 4.5 Miles, New Hat, New Shoes, Oh My! Today’s training called for a 4.5 mile run. It was a beautiful afternoon here in NJ. Temps in the low 50s and the sun decided to say hello. It got a bit windy at points but I welcomed it as I figured it would be good training for the New Jersey Half Marathon. It’s pretty awesome to be able to run outside on January 26th in northern NJ in shorts and no gloves or winter hat on. Take advantage of it when you can. I decided to run a course that I like to call my bread and butter. The first half of the route is uphill and makes me push myself. The last half starts off flat and then I get to enjoy a downhill followed by flat, to a small incline to finish off the run. I felt good today. I ran the 4.5 miles in 41:05 for a 9:07 pace. According to my FitBit Surge, my splits were M1-9:19, M2-9:06, M3-9:22, M4-9:03, M4 1/2 – 8:20 pace. Mile 3 stands out but that was because I had to stop and tie my shoelace. Isn’t it awful when you have to do that? I was feeling awesome too at the time, was in a groove, and that last thing I wanted to do was stop to retie my shoe. In my mind I decided to tell myself, hey, if you need to stop during your half marathon to drink fluids, this is a good practice for stopping and starting. See, just trying to think positive and use it as a runspirational moment. I was happy with my run today. Happy with the pace. Great sweat. Felt like I pushed myself today. 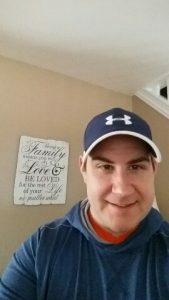 So I decided to run with my new Under Armour hat. Things were going great with it. It felt good, fit right, and I even think looked good. I hit some gusts of wind though between miles 3 and 4 though and wearing a hat with a brim wasn’t the best idea. I thought it was going to fly off and out into traffic. I ran a few hundred yards holding on to the brim. Definitely liked it though and happy with my purchase. 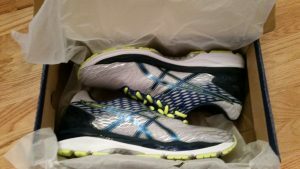 A few hours after my run, my new Asics Gel Nimbus 18 got delivered. I’ve been looking forward to receiving these. I go them at a great price on Sierra Trading. Only $89. I am going to break these in and add them to the rotation with my other Asics Gel Nimbus 18 shoes. I’ve been wearing that pair since October, so I’ll be retiring them soon. I plan on trying out the Asics Gel Nimbus 19 shoes soon as I want to rotate between 2 or 3 pairs with my runs. I have a gift card burning in my pocket from Christmas, so I’ll be looking at picking those up in the next week or so. I’ve been thinking about new pages/things to add to this website. I should be able to hopefully get that added soon. 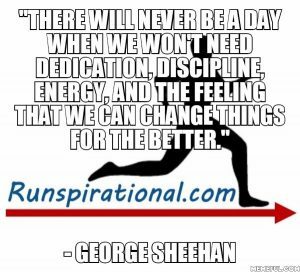 Have a great and Runspirational day! I figured since I just started this website/blog, Twitter/Facebook/Instagram accounts, now was a good time to put out some of my 2017 goals (even though January is coming to a close). So without further ado I present to you my Runspirational 2017 goals. Oh, today was a cross training day. I did the elliptical for 62 minutes. Was able to get my heart rate up and maintain it through most of the duration. I also was able to keep the steps per minute between 190-200 without holding on to the rails. Working on that. Great sweat and gave my legs a different work out.